Two Air Force generals — one the current U.S. Strategic Forces commander, the other his predecessor — declared publicly this month that they would defy a presidential nuclear launch order if they found it violated the Law of War. 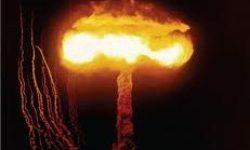 So what are the Law of War’s constraints are on a nuclear strike and could it be a plausible check on President Trump’s unilateral power to launch a nuclear strike? The Air Force general who commands the nation’s nuclear arsenal and one of his predecessors both said earlier this month they would defy any order to launch a nuclear strike that they considered illegal. 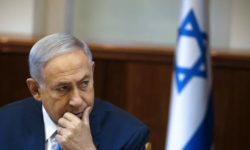 The issue has been raised, of course, by President Trump’s words with North Korea over the possibility of nuclear war. But there are doubts about whether a refusal to carry out an unlawful order could actually thwart a rash presidential command. Here’s NPR’s David Welna. DAVID WELNA, BYLINE: At a recent national security summit in Halifax, Nova Scotia, the commander of the U.S. Strategic Command was asked point-blank if he’d thought about what he would say should the president give him a nuclear launch order that violates the law of war. That could include, for example, targeting civilians or the excessive use of force. 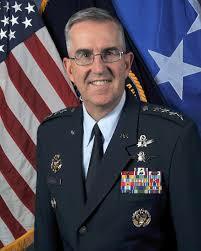 For Air Force General John Hyten, the question seemed almost insulting. JOHN HYTEN: We’re not stupid people. We think about these things a lot. When you have this responsibility, how do you not think about it? WELNA: The U.S. STRATCOM commander made getting an unlawful order from the president sound like no big deal. HYTEN: The way the process works is – it’s simple – I provide advice to the president. He’ll tell me what to do. And if it’s illegal, guess what’s going to happen. I’m going to say, Mr. President, that’s illegal. And guess what he’s going to do. He’s going to say, what would be legal? And we’ll come up with options of a mix of capabilities to respond to whatever the situation is, and that’s the way it works. It’s not that complicated. WELNA: But it did sound complicated at a Senate Armed Services Committee hearing a few days earlier that examined for the first time in four decades the president’s nuclear authority. New Hampshire Democrat Jeanne Shaheen pointed out it’s one thing to provide advice and quite another to have that advice taken. JEANNE SHAHEEN: One of the challenges is that we are dealing with a president who has not seemed to be willing to accept advice on an issue – many issues. WELNA: At that same hearing, former STRATCOM commander and retired Air Force General Robert Kehler also stated his willingness to defy an unlawful presidential order. But he acknowledged that generals are limited in their ability to overrule the president. ROBERT KEHLER: Other than to state their view about the legality of the move, the president retains constitutional authority to order some military action. WELNA: And that, Kehler added, would create what he called a very interesting constitutional situation. Members of the military would be disobeying their commander in chief. Justin Anderson is a research fellow at the National Defense University’s Center for the Study of Weapons of Mass Destruction. JUSTIN ANDERSON: If you receive an order that violates the law, you are obligated as a U.S. military member or a U.S. officer or a general officer to not follow that illegal order. And that applies just as well to nuclear weapons as it does to any other kind of military operation. CHARLIE DUNLAP: The challenge, of course, is determining in a very short timeframe whether an order is illegal. WELNA: That’s retired Brigadier General Charlie Dunlap. He teaches law now at Duke University, but he was once the senior legal adviser to the commander of STRATCOM. Dunlap says there’s a presumption in the military that all orders are legal unless they’re obviously illegal, rather than simply being a bad idea. But during more than three years at STRATCOM, the issue was never put to the test. DUNLAP: I don’t recall ever, even in an exercise, receiving what would be a patently illegal order that would mandate disobedience. WELNA: Under established procedure, the STRATCOM commander in Omaha is the one person the president would most likely talk with before ordering a nuclear strike. But according to Bruce Blair, a Princeton University scholar who is a former nuclear launch officer, the president could also skip that conversation. BRUCE BLAIR: There are no safeguards on the president’s authority to order the use of nuclear weapons. He simply can order up their use to the Pentagon war room, and they will carry out the order. WELNA: And whether it’s legal would likely only be decided later. David Welna, NPR News, Washington. Désarmement nucléaire : la France va-t-elle s’opposer à la majorité du monde ? 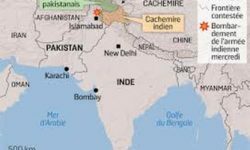 Inde-Pakistan : une crise jusqu’au nucléaire ?